Cabinetry provides workspace, foundation, and workspace for your kitchen design. They can be a bit expensive so it’s best if you look at some of the options you can afford. If your cabinet boxes are in good condition and you’re more budget-conscious, refinishing the cabinet will make it look better. Try changing the hardware of your kitchen to nickel-plate or pewter finishes giving your cabinet a fresh appearance that budget friendly. Custom made drawers enhance both the value and functionality of your kitchen making it a clutter-free and well-organized place. Islands and Countertops provide sufficient space in your room and make it more practicable. Select an island option based on layout and style of the kitchen including repurposed islands mobile cart islands and built-in island. Caesar stone quartz surfaces product are able to resist stains and scratches. Countertops and island will add value to your kitchen and give a maintenance free surface and a beautiful kitchen for you to enjoy for a long period. Transform your kitchen by brightening up the cabinet, ceiling and wall with some coat of paint. The color your select must be well blended and beautiful to align the entire appearance of your room. Select airy and light colors such as gray, ivory or white to have an exacting effect on the room and add color accent. Laminate and hardwood floor are the best choices that provide an excellent return on investment. Choose stylish and unique designs to add exceptional value and luxury to your home including reclaimed, Brazilian cherry, wide plank, and exotic hardwood. 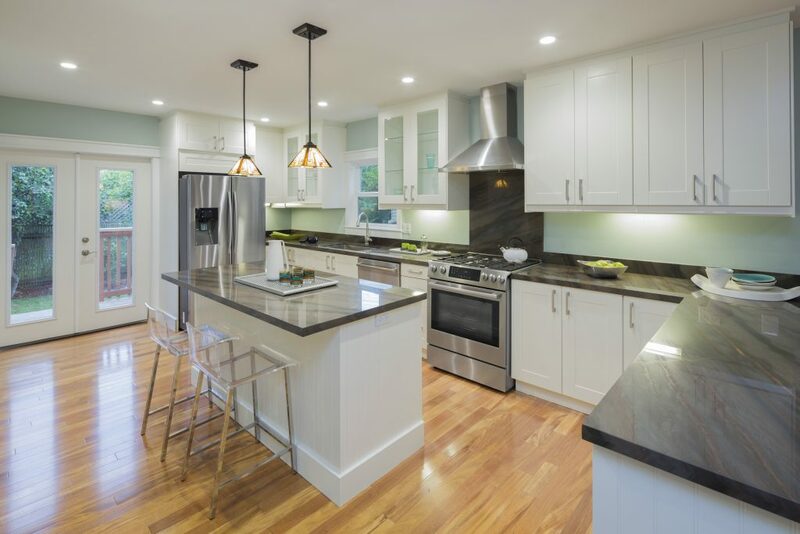 A small change of lighting like under-cabinet lighting, vintage, pendants, and drum-style chandeliers will have a huge impingement to your kitchen decoration. They add value and ambiance to the room. Under-cabinet lighting illuminates the work area of your room. Bright colored glass shades and unique patterns create a passion for mounting the pendant light over the island. Remodeling your kitchen room with high energy saving appliances like modern cookers, energy star qualified dishwashers, refrigerators, and ovens elevate your room’s value and reduce the electricity bill.